Black Bear Lodge Condo in River Run are the closest Keystone condos to the gondola in Keystone Real Estate. Located at the base of the ski area, Black Bear Lodge offers ski area views as well as views of River Run and the surrounding mountains. There are 39 condos in Black Bear Lodge making it one of the smaller lodges but not the smallest in River Run in Keystone, CO. The 39 condos are comprised of 22 – 1 bedrooms, 16 – 2 bedrooms and 1 – 4 bedroom condo ranging in size from 505 – 2297 square feet. Completed in 2011 Black Bear Lodge Condo underwent an extensive remodel to their amenities. This included a new lobby area complete with a roaring fireplace, lounge area with a large flat screen television, kitchenette for owners, exercise room, a new outdoor hot tub with a cascading water feature, outdoor firepit and barbeque area. The new and improved look of Black Bear Lodge Condo make this complex a must see in Keystone CO Real Estate. 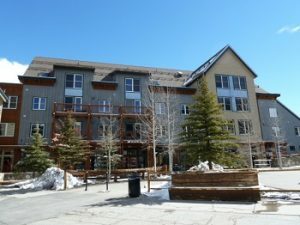 Jackpine and Blackbear Lodge Condo are two of the best complexes to consider when looking for condos for sale in Keystone CO. If you are considering purchasing a Keystone condo in River Run contact us today. We can not only schedule a time to view Keystone condos or any property for sale in Summit County Real Estate but we can also provide you with comparable sales data, market information and more.